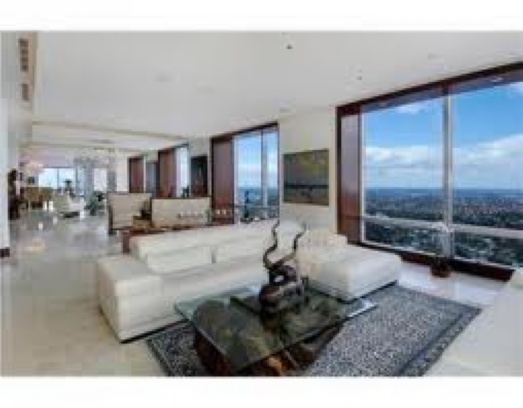 The Highest Penthouse in Florida is for sale in Miami. The Four Seasons Miami is the highest building in Miami and the Penthouse 70BCD is a nearly 6,000 square foot penthouse on the 70th floor. This penthouse is listed for 13.5 million and has 2 bedrooms and 3.5 bathrooms. There are literally panoramic views from every room in the home and no detail has been left out of this incredible property. There is an elongated gallery with tall cove ceiling, ideal for showcasing a massive art collection, which the current owner took seriously. All finishes in the home are German and Italian Marble the wiring is Crestron and Lutron systems. The amenities in this penthouse are incredible and are afforded by those with the most discriminating tastes. From the Swarovski Chandeliers, to the onyx bar with temperative controlled 20 case wine cellar, in addition to color changing lights and a 100 theatre screen with projector, and oversized master suite, this sky home has it all. The kitchen is chef ready with all Snaidero and Miele appliances, and accommodates catering as well as casual at home dining. All this is located within the esteemed Four Seasons Hotel. The Four Seasons Hotel and Residences is a premier resort environment in the heart of downtown. It is the tallest of its kind in Florida, and its reputation alone gives it an air of superiority. It is rightly deserved. This residence offers housekeeping, dry cleaning, child care, among features such as a top of the line sports club, swimming pool, country club lounge and relaxation areas, and a number of excellent business rooms and conference areas. Additionally, these residences are completely secure with 24 hour valet and security with assigned parking. It is located within minutes of both interstate 95 and 395 with easy access to the Miami International Airport, and is also conveniently situated to the Bayside Marketplace and Bayfront Park. For more information on this incredible building, please contact us today!